The U.S. economy added 243,000 jobs in January, far surpassing analysts’ expectations of around 155,000 jobs for the month. As a result, the unemployment rate also unexpectedly ticked down to 8.3 percent for January. The private sector added 257,000 jobs in January, while public-sector employment dipped another 14,000. And that last part is important, because it begins to reveal the truly destructive nature of austerity. Amid the wrong-headed drive to shrink the size of federal, state, and local governments (government employees make up one-sixth of the workforce), private sector job gains have been partially thwarted by the losses of government jobs. 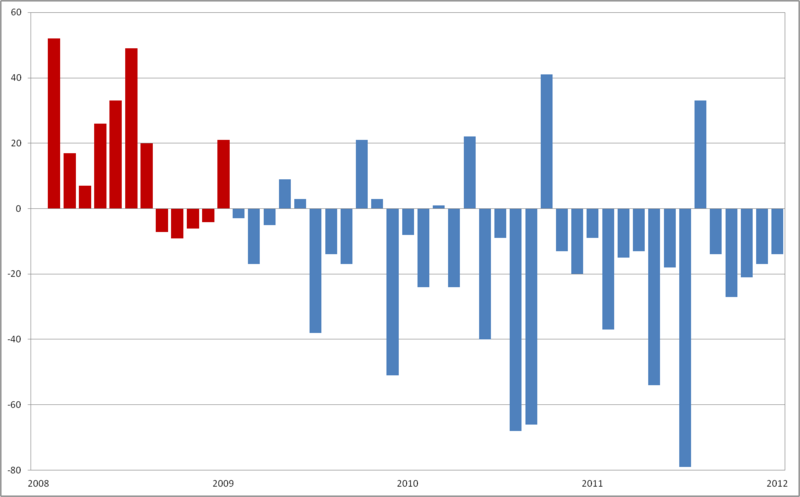 With the release of the jobs data each month, the ever-insightful Steve Benen – who joined The Maddow Blog this week – republishes his two charts showing job losses and gains for each month since the beginning of the Great Recession. 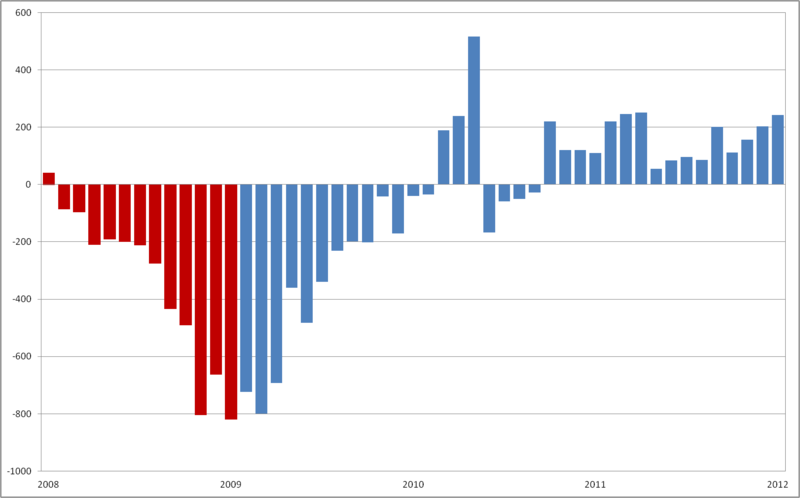 The second chart shows that the private sector has been adding jobs for each of the past 23 months. Also worth noting: there are more total private-sector jobs today (110.4 million) than in February 2009 (110.3 million), just days after Barack Obama took office. But I always wanted to see a chart which showed us what was happening in the public sector. 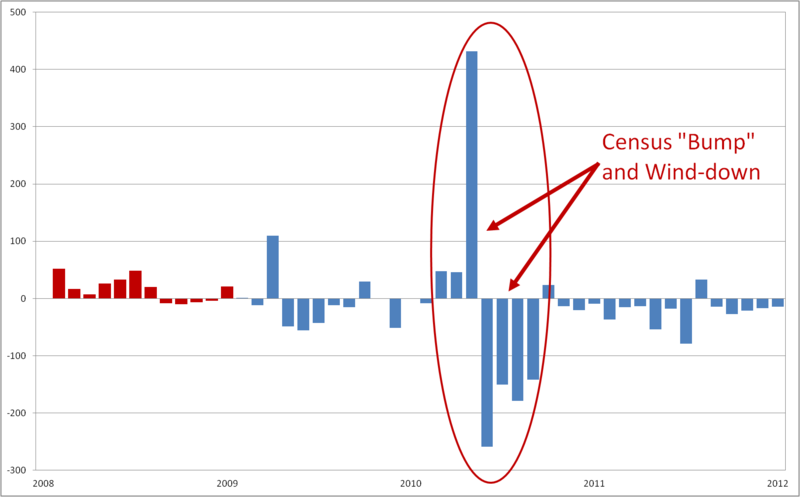 As I plotted the data, I began to understand why Steve might not show the public-sector data each month: The one-time massive hiring bump (and susequent wind-down) surrounding the 2010 Census dwarfed all of the other changes in the chart, obscuring the other month-to-month changes. 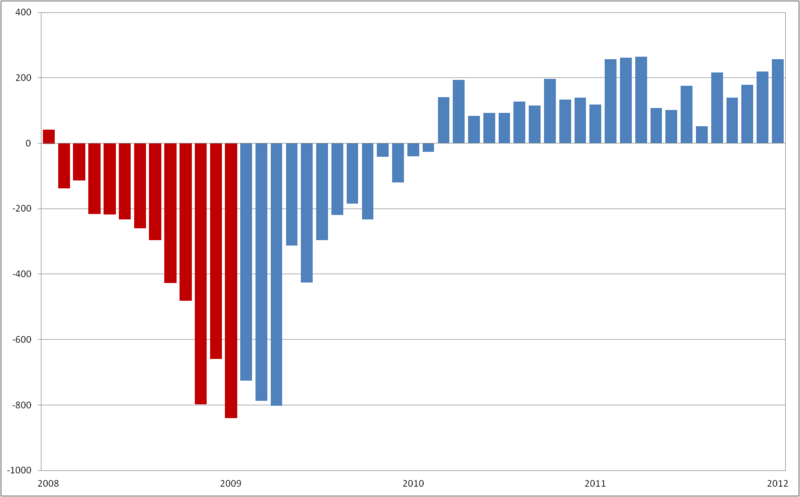 As a result, the chart provided little insight into the fundamentals of public-sector jobs. Fortunately, the Bureau of Labor Statistics published a press package which isolated hiring for the 2010 Census. This allowed me to disentangle the one-time effects of the Census from the underlying fundamentals of public sector jobs. In many ways, this public sector chart is the inverse of the private sector one. At the very moment when the private sector began to recover, at the very moment the economy needed to be firing on all cylinders, at the very moment the government should have leveraged negative real interest rates* to invest in jobs and infrastructure, one-sixth of the economy was (and continues to be) stuck in reverse. And as austerity economics kicked in, the losses in the public-sector have only deepened, creating significant drag on the economic recovery. Without these public-sector job losses over the past three years, the unemployment rate would stand at 7.9% today instead of 8.3%. While some might celebrate the wholesale destruction of government jobs, I don’t. Public sector employees are vital to our economy and to my business. Many of my customers are teachers, first responders, court personnel, and a wide array of other local and federal government employees. Public employees create better roads and safer neighborhoods and smarter students, all of which benefits my business. The destruction of public sector jobs negatively affects my business and our economy. As public sector employees lose their jobs, I lose business. And the wider economy suffers, as well. * A bit of explanation here on “negative real interest rates”: instead of expecting a positive return on government bond investm0ents, investors are now willingly paying to have the federal government hold their money for 5, 7, and 10 years. In essence, investors from around the world will pay us to invest in our jobs and infrastructure – which would, in turn, pay even greater dividends to our economy as we emerge from recession.